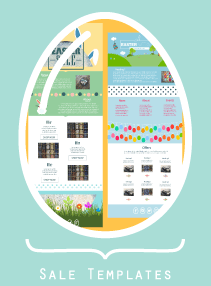 Easter Email Templates are here and you don’t have to get lost searching all over your yard for them. Spring is all about life. Longer hours, more sun, and more fun! Easter is the biggest holiday this time of year, and although Easter Break is now called Spring Break, everybody still loves a good Easter egg hunt. Take advantage of this and use some of our new Easter Email Templates to drive new sales. We have created some special new templates just for the holiday. There are two versions, one for newsletters and another for sales. Take a look and see which ones best fit your needs. Keep in mind that Easter isn’t just a season for selling colored eggs and chocolates. This is a great time for any business. Are you a retailer? Now’s the time to start pushing summer clothes! Real Estate agent or mortgage broker? Now’s the time that people want to get out and search for new homes. Reach out to them to let them know what you’re doing that can help them in their search! Spring also means Spring cleaning. A particularly special time for Do-it-yourself home remodeling. If you have products for homeowners, now is the time to push. Spring also means Summer is just around the corner. This is great news for hotels, travel agencies, cruises, and more as people are getting ready to book their Summer vacations. 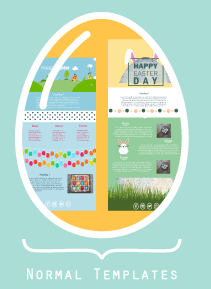 If you don’t want to use an Easter Email template, look through our gallery and find something else that’s light and bright to market your Spring activities. ResultsMail is here to help your Spring Email Marketing success!